If you live in LA, or any major city for that matter, you’ll know there’s something very unusual in the image above. It’s called the Milky Way, and it’s about as exotic as a cougar sighting. For most of human history, people could look up at the night sky just about anywhere on Earth and enjoy the splendor of thousands of stars. But if you live in an urban enclave today, there’s a good chance you’ve never seen more than a dozen. That’s why astrophotographers Harun Mehmedinovic and Gavin Heffernan are traveling across the country, visiting some of our nation’s darkest corners to capture rare portraits of the sky. They’re also creating composite and time-lapse photos, such as those shown here, to remind us just how brilliant the night is beneath the thin veil of artificial light. The artists hope to compile the entire collection into a new book which they’re now crowdfunding on Kickstarter. Galactic star trails spin over Los Angeles County Museum of Art. Milky Way passes over Hollywood Sign 2015. Stars spin over Los Angeles County Museum of Art. Stars passes over Capitol Records Building in Los Angeles. Star trails over downtown Los Angeles Freeway 2014. 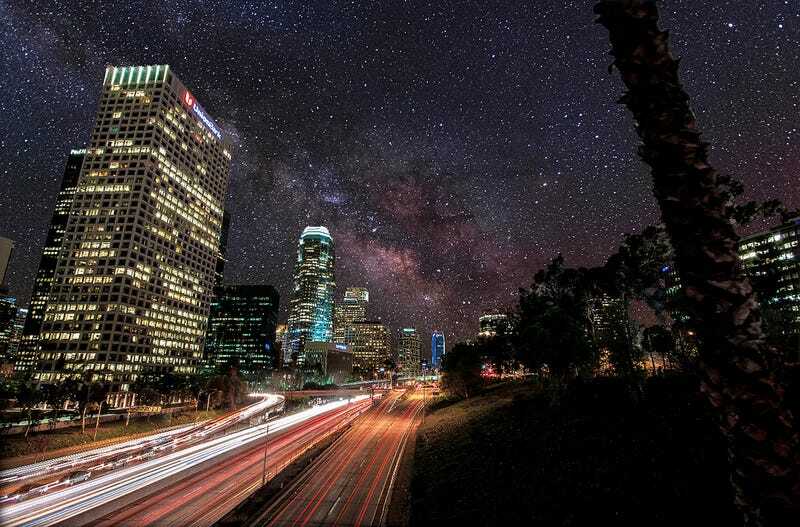 Light pollution over downtown Los Angeles. Taken from Mount Wilson, Ca 2015. Silhouetted Man watches star trails over the lights of Los Angeles 2014. While the project’s main goal is simply to inspire city dwellers, ultimately, the artists believe their work can serve as an educational tool to raise awareness about the negative effects of light pollution. Poor night lighting threatens astronomy and ecosystems, disrupts circadian rhythms, and wastes billions of dollars worth of energy each year. But just maybe, if we knew what we were missing out on, we’d find ourselves more inclined to preserve the night. All images were reproduced with permission from Harun Mehmedinovic and Gavin Heffernan. You can check out more photos on Flickr and learn all about Project Skyglow on Kickstarter.